Check out the first vendor to allow the sales of cannabis at the Enchanted Forest festival, this weekend July 22-24 in California. The Enchanted Forest festival is a boutique festival in Laytonville, CA that will be changing things up when it comes to the use of cannabis. Instead of simply ignoring that it happens, Emerald Pharms and the festival will be directly profiting from weed sales at the festival. Even though the Enchanted Forest is known for a wide range of substance use, it will be the first venue to allow legitimate sales. The interesting part about the Enchanted Forest festival is that the venue restricts alcohol use inside the grounds. Without the distraction of the most abused drug in the world, the festival-goers can responsibly try other substances to enhance their weekend. Having direct access to regulated cannabis should enable a safe and easy approach to exploring the effects of the herb. It could also prove to have a drug saturating effect; with everyone enjoying top shelf Californian cannabis, the people who were more prone to doing harsher drugs might feel like it’s not necessary. This could keep everyone much safer and give the festival a more relaxed vibe. With legal cannabis gaining momentum across the country, the U.S. could see a huge increase in the sales at festivals. Wouldn’t it be wonderful if, right next to the stereotypical Budweiser tent, you could see a beautiful display of cannabis strains just waiting for you? This is the future that we at HERB are waiting for; where every music festival has a great cannabis producer highlighting their months of hard work. The legality will be an issue for a while, but logical festival rules should keep this great idea under control. If the Enchanted Forest festival can run successfully, with cannabis being consumed responsibly, then other festivals might hop on the bandwagon after seeing its popularity. 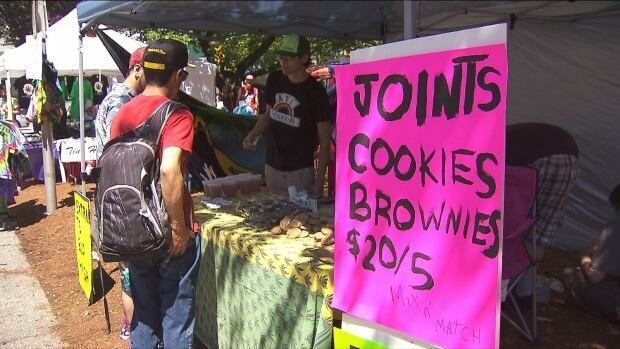 Wouldn’t you love to see cannabis vendors at your local music festivals? Do you think it’s possible to keep cannabis and alcohol on the same legal playing field? Join the discussion on social media or in the comments below!